Idle No More cofounders, Jessica Gordon and Nina Wilson have worked openly since the resurgence of the struggle for Indigenous and Environmental rights. They have tirelessly and relentlessly dedicated themselves to assisting grassroots members receive knowledge on the current landscape of grassroots organizing. They understand the importance of knowledge and training in order to advocate effectively, But more importantly, they have always known and seen the importance of boots to the ground activisim. Months ago was the time to begin establishing training for direct action and protection of land but due to some challenges this valuable work was delayed. 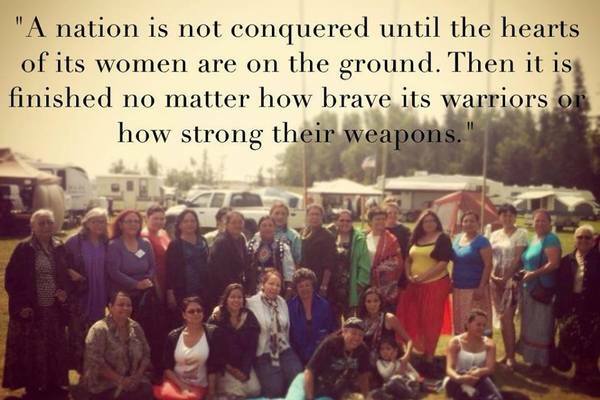 Jessica and Nina, recently found themselves at the fork in the road; one of which to continue advocating and build awareness or one of instilling and facilitating the tools needed for what it will come down to – front line protection not only of our peoples rights, but of our very existence. Nina and Jessica are now asking for your assistance in helping them be conduits for grassroots Non-Violent direct action training and strategic paths forward. We believe this is imperative in order to adequately defend the rights of our people and the environment. Front line training and rights recognition are at the forefront of the work we will need to ensure protection of Mother Earth and Sacred Sites. NVDA trainers to travel to central areas and provide training for attendees to take back home and share knowledge and strategy, this is the very definition of Grassroots, do not just advocate for the people, but train them to advocate for themselves more effectively. Building on and establishing working relationships for Sacred sites and Water protection. Research and knowledge acquisition to compile and share with communities. Compilations of work will be in the form of templates, workplans and possible solutions. Funds will be directed to a coordinator to compile and focus on this solely. Website to provide a central area in which information will be shared. We thank you for helping us be of service. All financial information will be available on the mentioned website. If in the future we are able to raise more funds , we will use have funds accessible to those communities and individuals doing the same work and mission. Every journey begins with the first steps, and every avalanche begins with just one snowflake. The purported authority of Elizabeth Windsor aka the “Queen” aka the “Wicked Witch of Windsor Castile aka Elizabeth, Chief of the Tribe of Judah is founded in the Royal Proclamation 1763. The only problem with this device is George Frederik aka KING GEORGE THE THIRD made no such proclamation nor, by Law, was it able to! Who made that proclamation? The same characters who invented the Rez schools, Vatican curia and its council of Cana’anitesCardinals dispensing the code of Cana’ancanon law. There are three areas required to expose the RP for the fraud it is and these would include the fact the RP has yet to be implimented! Frauds viciate contracts and the RP is a total fraud. Treaty 4, though not a proper Treaty via “mee a mey/”canadian” as well the alteration of the so-called Treaty after the fact. We are into the Seventh Fire and it is time to catch the wave! Unfortunately such White Indians as the; Gordons, Belgardes, and other White Indians are not allowed to assist in anything BUT to help the Anishinabe to the Buffalo Jump! If there are any TRUE Anishinabe still about it is time to hear the calling for the White Anishinabe, according to prophecy, are about to meet a most innovative and time consuming death for what they have been doing to the Anishinabe; selling us out!